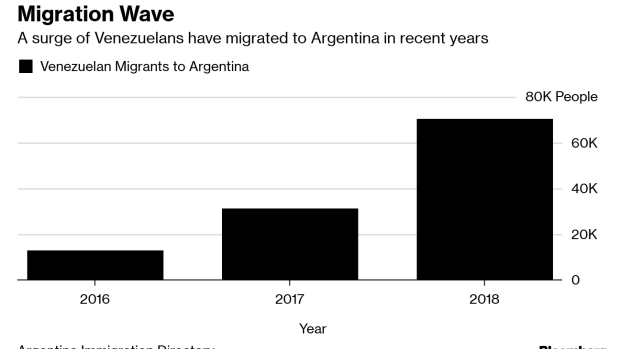 (Bloomberg) -- Argentina saw a sharp spike in Venezuelan migrants arriving last year, and the trend is expected to continue in 2019 even in the event of regime change, according to the Buenos Aires-based representative for Venezuelan National Assembly leader Juan Guaido. While official Argentine data shows that 70,000 Venezuelans entered the country in 2018, double the previous year’s total, Elisa Trotta Gamus estimates that the real figure is much higher. "There’s still a lot of people that come without documentation, so they’re waiting for an appointment at immigration offices," she said in an interview on Tuesday. This year, another 100,000 Venezuelans are expected to arrive, says Gamus, who is also the director of a non-profit assisting Venezuelans in Argentina. That pales in comparison to the millions that have emigrated around Latin America and the world. Still, Argentina is becoming an increasingly popular destination because the immigration paperwork is easy, there’s no language barrier and the country is largely welcoming towards Venezuelans.